We are the manufacturer of Chemical Hardener Making Machine, the hardener made up of our machine gives the very powerful performance as it gives max strength hardener cost start from Rs10/-per kg/L. We are the manufacturer of Tiles Chemical Making Machine, the hardener made up of our machine gives the very powerful performance as it gives max strength hardener cost start from Rs10/-per kg/L. 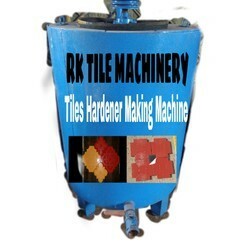 R K TILES MACHINERY manufacturer of Hardener Making Machine and also providing of consultancy of making cement concrete hardener chemical which is also called concrete admixture. Our technical teams keep on research of latest technology of admixture making process. We provide a proper formulation of making admixture with live telecast production by machinery. And also provide a test report on concrete admixture. These admixtures are best for both concrete like:- reinforcement concrete and precast concrete. R K TILES MACHINERY manufacturer of TILES Hardener CHEMICALMaking Machine and also providing of consultancy of making cement concrete hardener chemical which is also called concrete admixture. Our technical teams keep on research of latest technology of admixture making process. We provide a proper formulation of making admixture with live telecast production by machinery. And also provide a test report on concrete admixture. These admixtures are best for both concrete like:- reinforcement concrete and precast concrete. We are the leading name in this domain of Tiles Chemical Hardener Making Machine. This machine is precisely manufactured using the finest grade component and advanced technology at our well-maintained production unit. chemical hardener cost start from Rs 10/- per Kg/L . In order to meet our client's demand, we are offering newest design Hardener Making Machine. 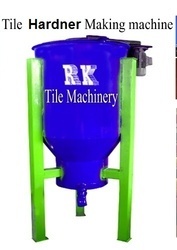 R K TILES MACHINERY manufacturer of Chemical Hardener Making Machine and also providing of consultancy of making cement concrete hardener chemical which is also called concrete admixture. Our technical teams keep on research of latest technology of admixture making process. We provide a proper formulation of making admixture with live telecast production by machinery. And also provide a test report on concrete admixture. These admixtures are best for both concrete like:- reinforcement concrete and precast concrete. RK TILES MACHINERY manufacturer of Paver Block Hardener Making Machine and also providing of consultancy of making cement concrete hardener chemical which is also called concrete admixture. Our technical teams keep on research of latest technology of admixture making process. We provide a proper formulation of making admixture with live telecast production by machinery. And also provide a test report on concrete admixture. These admixtures are best for both concrete like:- reinforcement concrete and precast concrete. We are the manufacturer of Tiles Chemical Making Machine, the hardener made up of our machine gives the very powerful performance as it gives max strength hardener cost start from Rs10-15/-per kg/L.